Despite this being the coldest summer in the San Francisco Bay Area that I can remember, my tomato plants produced their first little, shiny, red tomato. Now if we’d just get some sun instead of wind and fog, the green ones might get a chance to ripen too. All I know is that this is the first summer that my down comforter and electric blanket have remained on my bed all the way through July. I wouldn’t want to trade for the extreme heat in other parts of the U.S. and the world, but it would be nice to have a little bit of summer before fall! P.S. In case you have sharp eyes and noticed that the stem behind the tomato seemed to have previously held four tomatoes, you’re right. It was leftover from a purchased bunch of tomatoes on the vine but I thought it was cute and would look nice in this picture. We have the same problem in San Diego! Happy gardening! Thank you for sharing your sketchbook entries and paintings. I love your work and you have inspired me to spend the day sketching! I just returned from a trip to California and it is so beautiful there…your sketches remind me of my wonderful vacation. I especially love the gladiola entries. I love to call them “glad all overs”…because they are. I really like this sketch, and your confession that the stem was arranged! 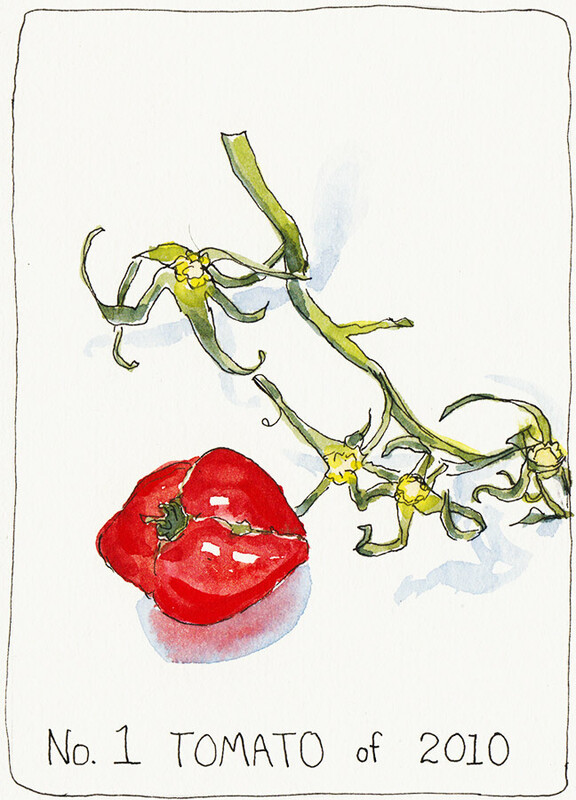 You’re one tomato ahead of us….and ours are planted in a greenhouse (to maximize the heat). This has been a pretty mild summer in the west, it seems. Beautiful painting! I love fried green tomatoes…so I wouldn’t need more sun!LOL! I wish you sun..Here in North Carolina we have much sun! and the second crop of tomatoes have maybe 4 more weeks til they ripen..I don’t grow them though..my hats off to you Jana for taking time to grow them:)! There is nothing like a grilled cheese sandwich with fresh sliced tomatoes on it:). Yes, weather is a-gettin’ weirder! We’ve just had two beautifully, warm days and yesterday was shorts n T shirt. And I had to water my tomatoes. i just play around sometimes, try really hard sometimes, even surprise myself sometimes, but then I see real talent with watercolor by someone like you and i know that i will never live long enough to be that good. but it is inspiring, i must say. I envy your weather!! The humidity is so high here that even at 90 degrees, it is unbearable! Lovely tomato! My plants have already been scorched to death.